The quality of our health – the amount of energy we have, our weight, our brain function, everything, is tied to the fats we eat. I’ll explain what fats you should eat, which to avoid and share the recipe for the perfect blend of fats for balance, energy and clarity. Fact #1: Fat is a structural component for every cell in our bodies. Fact #2: Since our bodies cannot create EFAs (Essential Fatty Acids), we must get them from the food we eat. This is why they’re ESSENTIAL, because the body cannot create them. Fact #3: Cell membranes rely on a daily, balanced supply of EFAs. Not eating enough FAT makes it impossible for your brain cells and nerves to function, sentencing them to an early death. There are fats that generate ketones, a source of energy that’s quickly used by the body as an alternative fuel to glucose, and there are fats that act like hormones. What role the fat you’ve just consumed has in your body depends on what it’s made up of. Ketone-generating fats are rich in medium chain triglycerides. Things like coconut oil, butter and palm oil. Hormone-acting fats are your classic “omega” fats. Things like flax oil, chia oil, hemp oil, fish oil, camelina oil, organic eggs and grass-fed, organic meats, (and on the flip side) the not-so-good-for-you canola, sunflower and grapeseed. These fats; good and bad, come in 2 different packages – omega 3, and 6. The ideal balance of omega 3 and 6 should be a ratio of 1:1. Our current eating patterns, it’s in the range of 1:25. Crazy pants. I’m learning, is in a) the type of fat we eat b) the quantity of fat we eat. Long did I subscribe to the standard recommended proportions of 60% carbohydrate, 20% protein, 20% fat. But our cells don’t need carbohydrate to function like they do fats. So why the heck are we being told to eat such a large portion of carbohydrate and barely any fats? Knowing just how essential fats are to our health, our energy intake should look something like 70% fat, 20% protein, 10% carbohydrate. Balancing the good, the bad and the ugly can get daunting. I’m all about EASY nutrition, the mindless, effortless stuff. And, finding resources and products that make living your healthiest life a breeze. 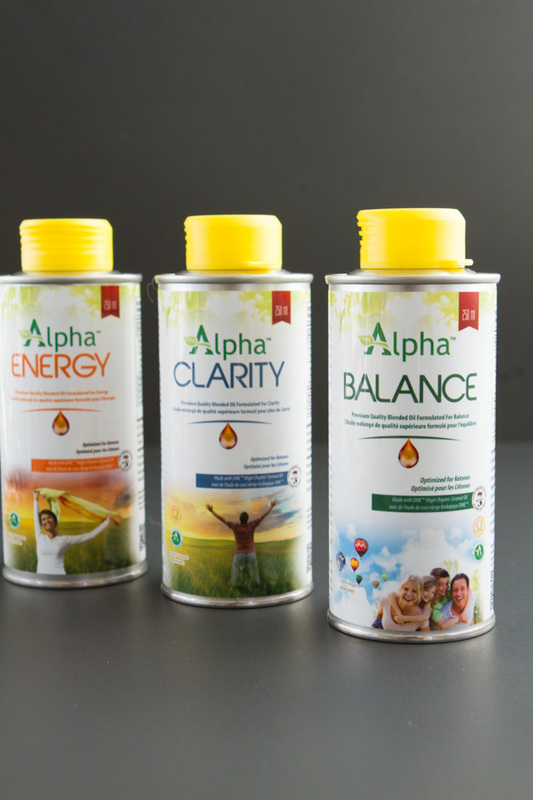 Keeping omegas in check, consuming a healthy balance of ketone-generating fats, and ensuring a good supply of perfectly balanced fat is made easier with Alpha’s new line of blended oils, each one formulated with high quality ingredients to bring out your best health. 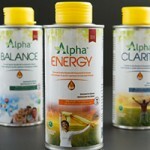 Choose from Energy, Balance and Clarity for your optimal health. 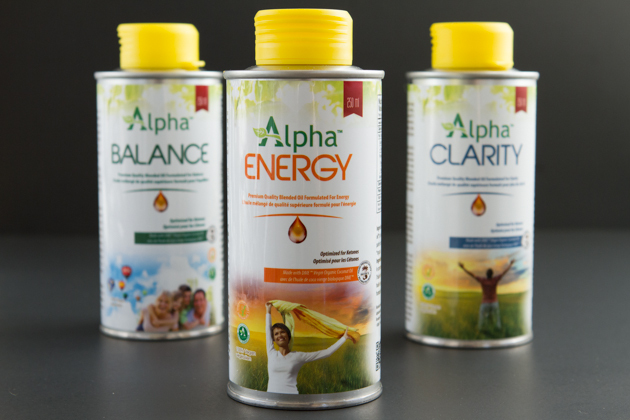 One of their blends, Alpha Energy, is a mixture of medium chain and vegan sourced Omega-3 oils to supply the body with long lasting energy. Loaded with ketone potential, it’s formulated for a corrective 2:1 Omega-3:6 ratio, and contains a natural blend of antioxidants to protect the Omega-3 oils. Not a cooking oil, this blend is best for baking (under 350F), in cold foods, or on hot food after preparation. 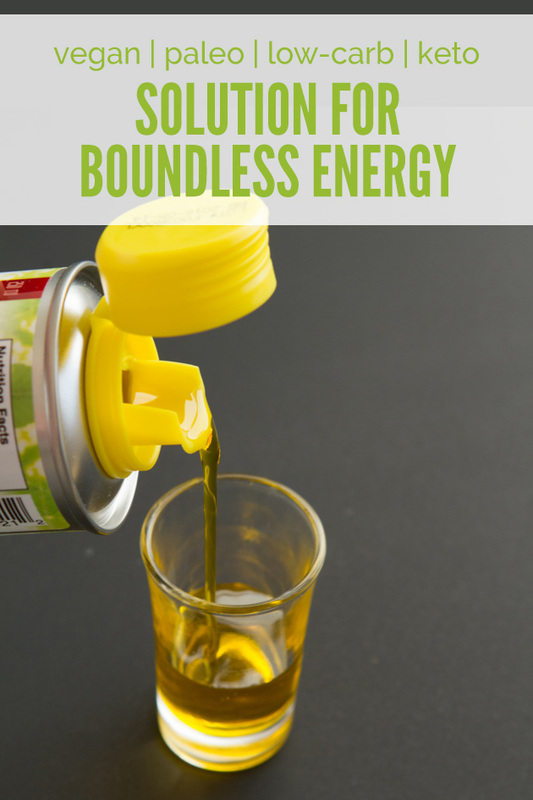 As with any edible oil, it’s best to start slow and work your way up. I advise my clients to begin with 1 teaspoon and gradually increase every 3-4 days until they reach their desired amount. I enjoy 2-3 tablespoons per day. Have you heard of it? Camelina sativa or “wild flax” is a powerful oilseed source of essential fatty acids and high in natural vitamin E. Unlike flax and fish oil, it has no bitter or fishy taste, and has a shelf life of 12-18 months because of its high Vitamin E content. 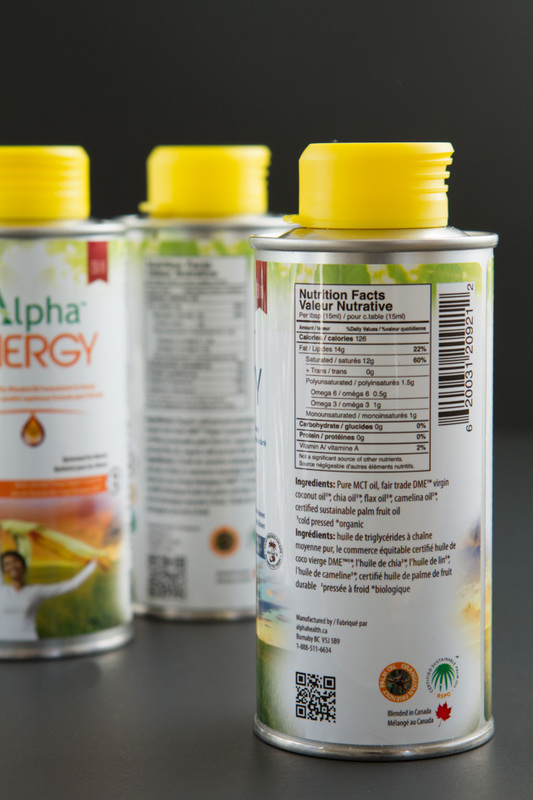 I want as many of you to try this oil as possible so, we’re giving away TWELVE, 500mL bottles of Alpha Energy to a bunch of you lucky guys and gals to try out. AND winners will be invited to an online party with me to chat about high-fat living and what you thought of the prize.